When the final day comes for the ultrasound machine at its current location, Nationwide crews perform final testing on the system before we remove power from the unit. These tests are to ascertain the condition of the system before it is removed and transported. Once these test are performed and documented, the unit is powered down. Power is removed and the cables are disconnected and labeled then neatly packed. All major components are unbolted from the floor and pad wrapped to protect the finish of the components. OEM dollies are attached to the base of the major pieces and removed to be own transported by a modern air ride semi trailer. The Ultrasound equipment is strapped down within the trailer for a secure ride. 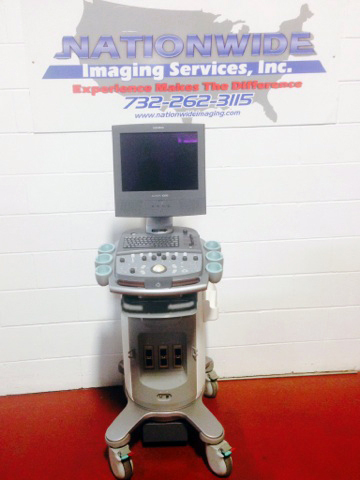 Once the ultrasound machine arrives at the Nationwide facility it is again inventoried. The covers of the pieces are removed from the system and tagged as to their location and system number. The covers are taken to the cosmetic repair center. There they will be prepped, masked and painted to the OEM colors or whichever colors the customer prefers. The major components are cleaned with a variety of processes that sterilize, cleanse, and prepare these devices for cosmetic’s and operations. There are then moved into a testing bay where they are cabled up and power applied. The system is then again tested to determine if all manufactures mandatory upgrades have been performed. Any items that are not satisfactory to the manufacturers specifications or are close to failing are replaced. Once the ultrasound equipment has been thoroughly and completely tested and checked, the covers are reattached and the system is energized for 24 hours to monitor for system faults under test and heated operations. Once this is competed the system is then certified reconditioned. The unit is de-cabled and wrapped for its’ move to a new home. There the ultrasound machine will be professionally installed by one of Nationwide’s crews.